“Stay still, Corona,” she pleaded, patting the horse on the shoulder. She swung her leg over the horse, determined to successfully complete one dismount before the challenge ended. Her arms shook as she lowered herself carefully from the saddle, finally giving up their fight part way down. Gravity took her the last few feet and she hit the ground with both feet, stumbling backward a step before bumping into something solid. “How, Cassidy? How do you always end up in my arms?” Evan’s voice rumbled in her ear, his warm breath on her earlobe making her girly bits tingle. She found her footing and turned in his arms. She could see the dust and dirt clinging to his five o’clock shadow, his brow beaded with sweat. He desperately needed a shower and there was nothing she could have fantasized about more than being in one with him. Instead, she pushed herself back from him and swallowed her urge to climb him like a jungle gym. “What can I say? I guess I just keep falling for you,” she said, before her brain caught up to her mouth and she was able to censor herself. Intrigued? 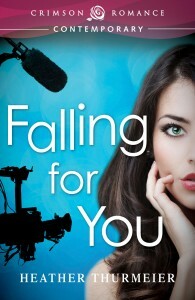 FALLING FOR YOU will be available everywhere on August 20th but you can pre-order it on Amazon today by CLICKING HERE!